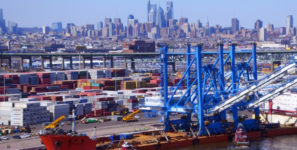 PORT OF PHILADELPHIA'S PACKER AVENUE MARINE TERMINAL WILL BE THE FIRST ON THE DELAWARE RIVER TO ACCEPT LARGER VESSELS: That's thanks to federal dredging dollars and $300 million state investment. US Army Corps of Engineers allocated $29.25 million towards Delaware River deepening. Federal money allows completion of deepening Delaware River to 45 feet. The Delaware River Channel Deepening Project is a 103-mile long $392-million project. The US Army Corps of Engineers released its Fiscal Year 2017 Work Plan which allocated $29.25 million towards the Delaware River Main Channel Deepening Project. That money, combined with the $33 million that Congress approved earlier in the month, represents the final federal appropriations to complete the deepening of the Delaware River navigation channel to 45 feet. The Delaware River Channel Deepening Project is a 103-mile-long $392 million project. This federal project is funded by both federal and local sources. The Port of Philadelphia (PhilaPort) is the local sponsor of the project and the signatory of the Project Cooperation Agreement known as the PCA. Pennsylvania has spent $137 million to ensure this economic engine keeps up with competing ports in the Mid-Atlantic. This is the final piece of funding that ensures that the Delaware River will be deepened to 45-feet by December 2017. Additional work to complete the project will continue through 2018.